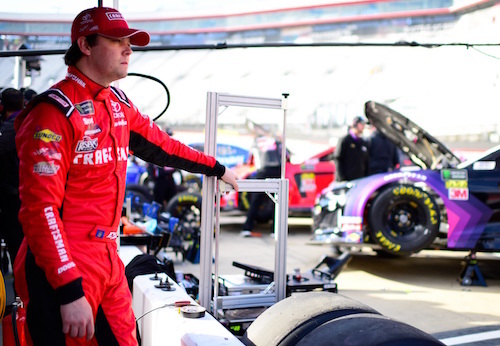 during practice for the Monster Energy NASCAR Cup Series Food City 500 at Bristol Motor Speedway on April 6, 2019 in Bristol, Tennessee. Although Monster Energy NASCAR Cup Series qualifying at Richmond (Va.) Raceway for Saturday night’s Toyota Owners 400 was held Friday night, the starting lineup didn’t become official until Saturday afternoon after the completion of post-qualifying/pre-race inspection. And the inspection heavily impacted the starting grid with eight of the 37 cars failing inspection at least once. Kevin Harvick’s 21.722-second/124.298 mph pole-winning lap stands, as Harvick’s car passed inspection. The front-row of Saturday’s starting grid has changed, though, as the provisional second-place starter, the No. 20 Joe Gibbs Racing Toyota of Erik Jones, failed its first time through inspection. As a result, his qualifying times were disallowed, moving him to the back. Jones’ failed inspection moves Kurt Busch up to the front row to start alongside Harvick in the second position. Four of the provisional top-10 qualifiers failed inspection — Jones, Chase Elliott, Daniel Suarez and Jimmie Johnson. With those drivers moving to the back, Kyle Larson, who was 14th in the second round of qualifying Friday moves into the top-10 for Saturday’s green flag. Larson was fastest in the lone practice session Friday and was second to his Chip Ganassi Racing teammate, Busch, in the opening round of qualifying. With inspections complete, the official second row of the Toyota Owners 400 starting grid includes Joey Logano and Kyle Busch, with Martin Truex Jr. and Austin Dillon in the third row. Other cars that failed inspection include those of Aric Almirola, Denny Hamlin, Matt Tifft and Joey Gase. Those who failed inspection will start based on owner points in positions 30 through 37th on the grid. That puts Hamlin in 30th, Almirola 31st, Elliott 32nd, Suarez 33rd, Johnson 34th, Jones 35th, Tifft 36th and Gase 37th. Inspection issues continued for Elliott, Hamlin and Tifft, as their cars failed a second time through inspection. As a result, a team member for each of those teams, likely each team’s race engineer, will be ejected upon the completion of inspection.